It’s no surprise that three successful singer/songwriters (Kristian Bush, Jennifer Nettles and Kristen Hall) with years of experience can make an album filled with solid, intelligent music. But even the members of Sugarland themselves are slightly shocked by how fresh-sounding and unfailingly optimistic the songs they make together are. Within minutes of getting together, the trio clicked, creating something completely different than anything any of them had done before. The songs are rootsy and lyrically sophisticated, but still catchy and accessible. Somehow these niche artists have found themselves making mass-appeal country music. 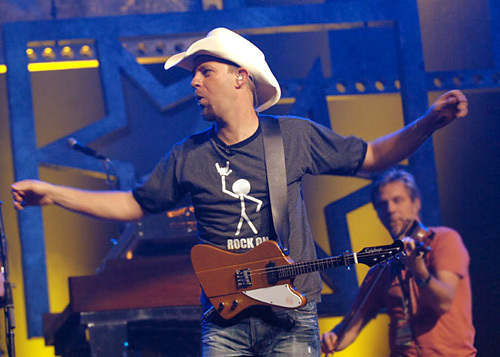 Four months after getting together, Sugarland played their first gig and were astounded by the audience reaction. By their fourth gig, they were selling out 1000 seat venues. Two weeks later, they signed a contract with Mercury Records. Epiphone’s Don Mitchell recently spoke with multi instrumentalist Kristian Bush. EPI: Hey Kristian, congratulations on your success with Sugarland this past year. What’s going on right now with the band? KRISTIAN: Well, this week was even better than last week. (Laughs) We found out we have three CMA nominations which is pretty mind blowing and we start the Brad Paisley and Sara Evans tour in about a week so we’re trying to get our arena rock on right now! EPI: You guys started this all out of Atlanta, right? KRISTIAN: Yes. 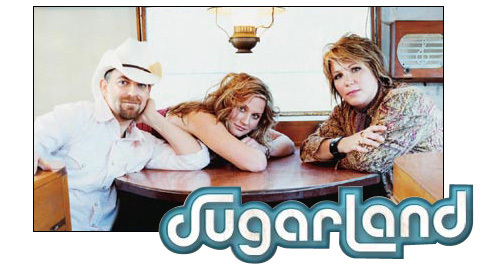 Sugarland actually started as a writing appointment between Kristen and I. She had just moved back from Los Angeles where she had been honing her skills as a pop song writer, and had been quite successful. She came back home and said you know what, people in Atlanta are just as talented, I don’t know why I have to be in L.A. So she moved back, canned her publishing deal and set out to write with her friends in Atlanta and I was one of the first she called. Almost immediately we knew we had something pretty cool. As a writer, when you can’t figure out who wrote what line, you’re doing really well. You’ve kind of melded your minds together. So it worked well and Kristen suggested that we form a band. To be honest, I wasn’t quite sure that’s what I wanted to do but I finally agreed. About two months later we decided we needed a singer that wasn’t one of us and Jennifer was one of the first we talked to. At the time she was doing really well in Atlanta so we were a little surprised when she agreed to try it. EPI: Did you know each other prior to this? KRISTIAN: We knew of each other because we had all seen some success throughout the southeast on our own. My band “Billy Pilgrim” was signed to Atlantic Records and we had toured the world a couple of times. Kristen had sold hundreds of thousands of albums like we had and Jennifer was kind of in the generation behind us. While I was out on the road Jennifer kind of happened. She had gone from the person that opened for you to the one that headlined to the one selling out theatres. That’s about the time we caught up with her. EPI: I think it’s cool that you were able to put this together in your hometown. KRISTIAN: That was very important to us because we knew what we didn’t want to do. When we started piecing together what we did want to do, the choice was Sugarland. EPI: Tell me about your early musical development. KRISTIAN: I started writing music as a kid with my brother Brandon. He’s now the piano player for the rock band Train. We started making homemade albums when I was about twelve so we were pretty well versed in studio stuff by the time we were teenagers. I think by the time I was seventeen I had already recorder five or six albums, real albums in studios. I was a huge Charlie Sexton fan at that time because he pulled it all off when he was seventeen. He was my hero because he proved to me that you could be taken seriously as a musician at a young age. EPI: What was your first instrument? EPI: You play a lot of mandolin in Sugarland. KRISTIAN: Yes, I have a Gold Flake Mandobird and it’s awesome! I’ve only been playing mandolin for about three years and I’m loving it. It’s amazing how many people don’t know about mandolins! I have people come up to me after shows all the time asking about the mini guitar I play! I guess I am probably a traditional mandolin players nightmare. It’s all still pretty new to me and I’m running the acoustic and electric mandolins through a pretty tricked out pedal board. I fully endorse the Gold Flake Mandobird! I’m not sure I’ll be remembered for anything other than being experimental with the mandolin, but I still try and take it seriously. I have a mandolin teacher and I practice every day. EPI: Speaking of the Gold Flake Mandobird… I understand you used it on CMT’s Crossroads with Bon Jovi. What was it like to share the stage with Bon Jovi? KRISTIAN: Well first of all… HOLY CRAP, BON JOVI! I’m not sure what expletive I can use on-line but….In the words of Richie Sambora, “Rock Out With Your C*** Out”! So yeah, I’m on stage with Richie Sambora, playing a Mandobird and I’ve got it jacked through a Tube Screamer and a Fender Twin turned up so loud its making the bottom of the stage shake… and I got to play “Livin’ on a Prayer” with him. I mean jeez, that’s a fifteen year old dream right there! EPI: Was Bon Jovi an influence on you as a youngster? KRISTIAN: Put it this way. The producers of the show send you a CD and a note that says here are the songs you need to learn of the other band. I looked at it and I was like OK, I know all these! (Laughs) I mean, these are all songs you played in every high school band you were in. If you were alive and playing at that time you were playing those songs. What I didn't know was how to play them on a mandolin. EPI: What was it like to hear them play some of your songs? KRISTIAN: It was amazing! They told us they hadn’t rehearsed in fifteen years. For people who are in bands, you kind of get the impact of that. You know, they’ve been playing these great songs that they wrote for years so they’re not going to forget them or change the way they do them. Now they are getting together to learn new songs. When is the last time Bon Jovi learned a cover tune… and imagine it was a Sugarland tune! How funny is that? They were really nice and in my world Richie was unreal. Not only is he this extremely talented musician, but he has this genuine joy for music. He’s just one of those guys that loves to play and it was awesome to share that with him! EPI: You guys have been on a pretty fast trip to the top. How has the “Spotlight” affected your personal life? KRISTIAN: You gotta remember we live in Atlanta so unless your Ludacris, there is no spotlight! (Laughs) I’m still trying to convince my friends that I’m successful. EPI: So being in Atlanta is a good thing? KRISTIAN: Oh, it’s a great thing. ..I love the people there and my friends there. I invite them over once in a while and point to the platinum record and they are like, HOLY CRAP, what are you doing. I try to tell them… no, no, turn on CMT and check it out. That’s us with Bon Jovi to which they respond, whatever! (Laughs). Maybe by the time I get home for Christmas they’ll get it! EPI: Oh I think they will! You’d have to be under a musical rock to miss you guys at this point! Thanks for taking the time to chat and we look forward to seeing that Gold Flake Mandobird on the road with you and Sugarland! 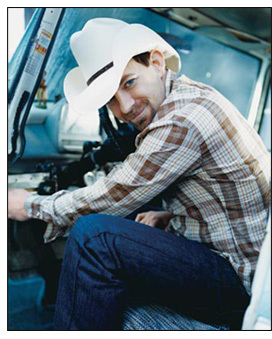 For more information about Kristian visit www.KristianBush.com and www.SugarlandMusic.com!